VPNs are used for a variety of purposes and while browser extensions are limited to the environment of the browser, offer the same features as private networks that you connect to on a system-wide level. Virtual Private Networks encrypt all traffic and by doing so protect the traffic from prying eyes. Since you connect to the server of the service first, it is this server that Internet sites and peers connect to which means that the IP address of the computer that you are using is not revealed. In addition to improving privacy and security, VPNs allow you to access contents that are restricted to select regions or countries. If you are abroad and want to watch Internet TV at home, you can't do so usually because these contents are region locked most of the time. Note: Other software running on your system or in the browser may leak your computer's IP address. If you check on Cloakfish for example, you will notice that your original IP gets leaked if you have Adobe Flash enabled even if you connect with ZenMate. When you are connected to a VPN however, it is the server IP that is used to communicate with the TV site and not the local IP address of the computer you are using. After you have installed the extension from the developer website -- it is not available on the Mozilla website right now -- you are required to enter an email address on the page that opens when you click on the ZenMate icon in the Firefox toolbar. After you have done that you receive a password which you can change. There does not appear to be any kind of verification of that email address though. A second click on the extension icon displays information about the server you are currently connected to, an on/off switch to connect or disconnect to the VPN, and an option to change the server location. Bandwidth is unlimited during the launch phase according to the ZenMate team. Traffic will become limited eventually though for free users. For now though, nothing seems limited and everything can be used to the fullest extent. The add-on for Firefox works in the same fashion as the Chrome extension. A quick test on popular sites such as Pandora and Hulu was successful as both services worked as expected after the installation of the add-on. Some sites on the other hand took a long time to load but a reload fixed that every time this occurred. 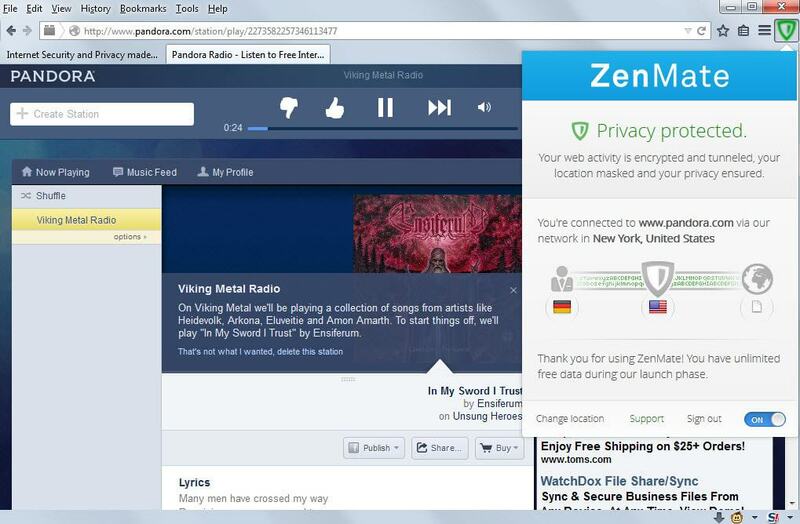 ZenMate will become a popular add-on for the Mozilla Firefox web browser, there is no doubt about that. It is unclear if it will be uploaded to the official store as well as it would improve the exposure of the add-on and improve the trust factor as well. Since bandwidth is not limited right now, it is an excellent option to access streaming media sites. Now Read: The best VPN add-ons for Firefox. Chrome user can use Flash Control. But I wouldn’t trust any FreeVPN servers, and Symantec is behind ZenMate … (nothing more to say … Symantec … :-D). DisableSockets disables all socket connections, except those specified under EnableSocketsTo. Trick is, since ZenMate works only with Chrome & Firefox, to run Chromium with local Flash (instead of Chrome with pepper flash). Hmm… I guess I’ll be sticking with Epic Browser for now. Epic broswer offers nothing special, and no vpn. Besides, “Hidden Reflex is a privately-funded software start-up company based in the United States and India”, and its not open source. Great news! Unfortunately it won’t work in Palemoon but at least I don’t need to use Chromium anymore. ZenMate has not yet posted which Firefox versions are compatible with ZenMate. Interesting. My first approach to a VPN. I’ve set as mentioned above by CHEF-KOCH, DisableSockets = 1 and EnableSocketsTo = 127.0.0.1 in my Falsh’s mms.cfg and doing so did prevent cloakfish.com from discovering my real IP. Moreove, this mms.cfg setting did not disturb Flash when Zenmate disabled (switching it to off rather). Question is, if Flash works with theses settings even when no proxy is running why not have this mms.cfg setting as default? I’ve had an issue when calling google.fr with settings as those of my Firefox’s search engines : browser freezed. But calling google.com with a VPN connection in London simply landed on google.co.uk, which is normal. What I understand less is that DNS resolver is changed as well. Is it a fake or are my DNS requests truly addressed to that other DNS resolver? I’m discovering. Not sure yet to keep it. I’ve set as mentioned above by CHEF-KOCH, DisableSockets = 1 and EnableSocketsTo = 127.0.0.1 in my Falsh’s mms.cfg and doing so did prevented cloakfish.com from discovering my real IP. Moreove, this mms.cfg setting did not disturb Flash when Zenmate disabled (switching it to off rather). Question is, if Flash works with theses settings even when no proxy is running why not have this mms.cfg setting as default? Interesting. This is my first approach to a VPN. Interesting. This is my first exercise with a VPN. @Tom, Tom, John G. & Tom : you took the words out of my mouth : exactly the same issues here. why do you recommend a program which doesn’t even run properly on FF? Woo Hoo, I’m listening to Pandora And Spotify and I live in South Africa! This is easy to install, and easy to remove without any problems. For me, there was one problem. It did not work. I am a Linux user, so that that may be the reason for my problem. However, I am not asking for assistance. I only installed it out of curiosity. I have now removed it. Why users must submit an email address to receive a password before ZenMate VPN can be used ? This is not the case with other free VPN proxy providers. Anyway, current & potential users of ZenMate might be interested in the following recent exchange between a concerned user & ZenMate Support, regarding how zenmate.com is routed through CloudFlare, as well as how ZenMate’s IP address (162.159.245.96) is shared with several other sites (hovering at 12 or 13 at the moment). ZenMate claims that “CloudFlare is mainly used for [its] website” & “static non-user specific content”. Hmm, besides “mainly”, how else is ZenMate using CloudFlare ? Where exactly are ZenMate’s VPN proxy nodes hosted ?